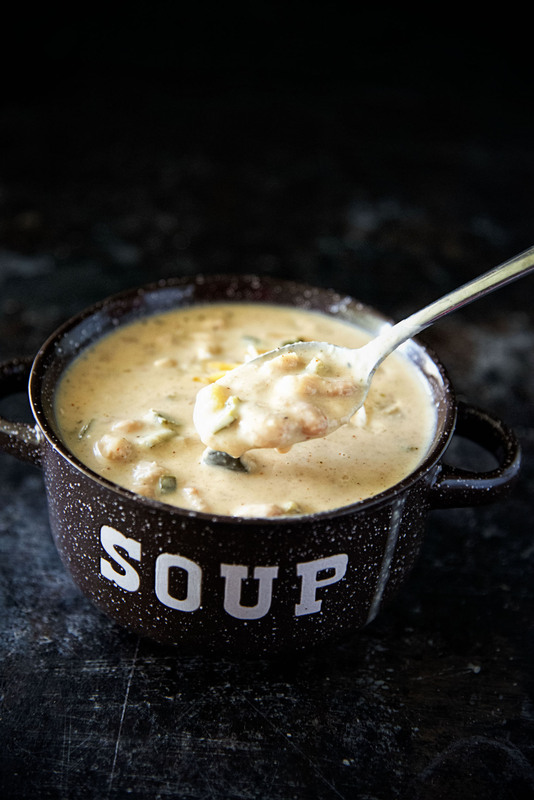 Vegetarian Roasted Garlic Chile White Bean Soup: This vegetarian white bean based soup is make extra special with roasted garlic, chili peppers, spices that bring just enough heat to the soup. Through out my life while living in Arizona, I met Senator John McCain on four separate occasions. Three were on purpose due to being at the state capital for teacher stuff and the state of education were the topics. I often did not agree with McCain on education funding (and other thing) but I was always a fan of the man himself. The fourth time I ran into him we talked about soup. 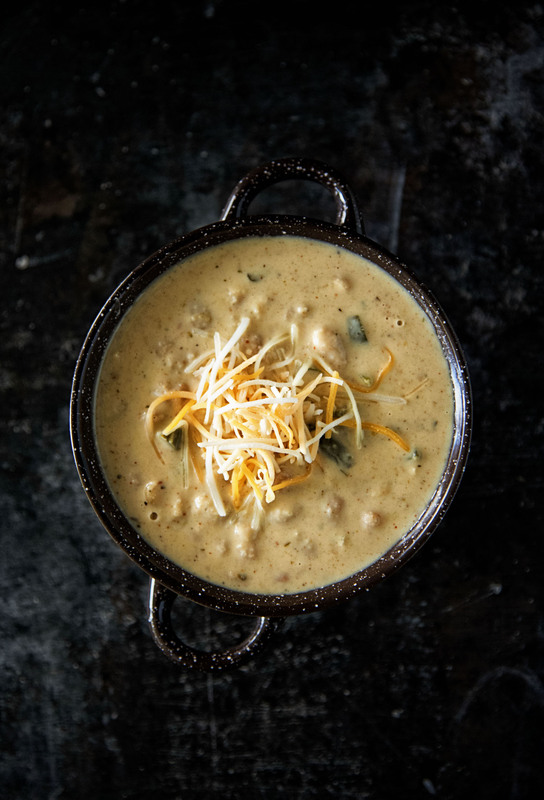 A Roasted Poblano Chicken Chowder to be exact. With his recent passings I thought about that conversation a few times over the weeks. Since we don’t eat meat anymore I wanted to sort of make a soup in honor of the senator but in a vegetarian way. 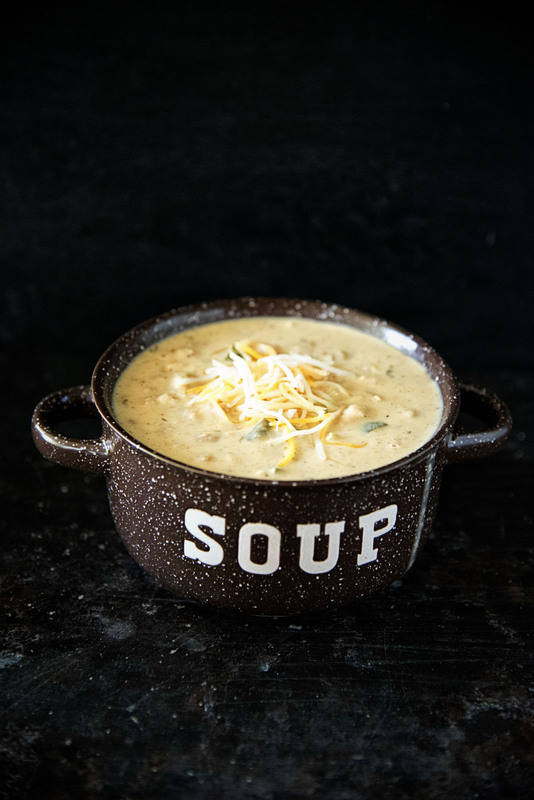 I’ve made variations of this soup over the years and it’s always better the next day. So keep that in mind when making this that it’s best to sit for 24 hours for all the flavors to develop. I traditionally use Anaheim and Poblano chilis for this but my grocery store didn’t have Anaheim’s so I used Hatch. When you first make this soup it will not seem that spicy. That is why you let is sit for 24 hours. The heat will come through but not in a knock you over the head kind of way. If you really want some meat you could add chicken or turkey to this. If you do that I would use one less can of beans. Toss onions and chilis in 1 TBSP olive oil. Place on one end of a baking sheet. Cut off the tip of the garlic bulbs, wrap in foil and place it cut-side up on the baking sheet. Drizzle the sliced end with a tablespoon of olive oil. Bring the edges of the foil up to wrap completely. Separate the chilis from the onions. Once chilies are cool, try to remove the skins. If they won’t come off it’s fine. Dice the cooled chilies. Set aside. In a blender add the onion, roasted garlic (squeeze out the garlic out of the skin and discard the bulb), and one cup vegetable broth. Add one can of beans to the mixture and one more cup of broth. Pour mixture into a large pot. Stir in the chili powder, cumin, oregano, coriander, cayenne, and flour. Cook, stirring constantly, for 1 minute. Add remaining 3 cups of the broth and stir to combine. Stir in the remaining beans, chilies, cream, and lime juice and cook until heated through.